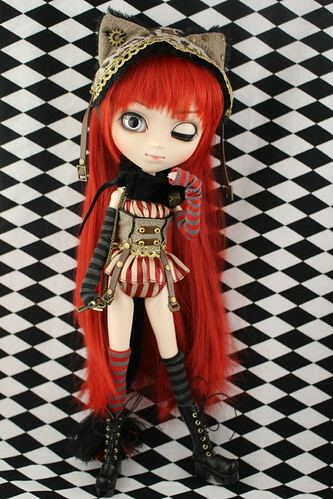 ← Pullip Cheshire Cat debut of New Style Eye Mechanism! 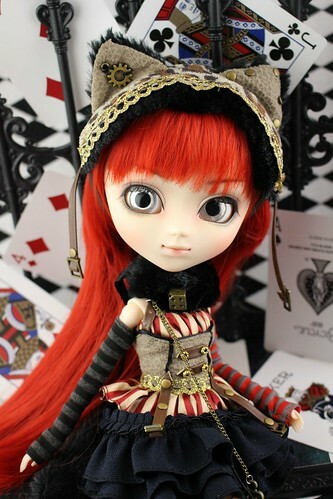 Alice in Wonderland has been an incredibly popular theme for Pullip over the years that has been revisited time and again, over the last two years Groove has been releasing a new series of dolls based on Alice in Wonderland with a steampunk twist called Alice in Steampunk World. The recently released Pullip Cheshire Cat in Steampunk World is the latest and possibly final doll released in the Alice in Steampunk World series (the start of the Optical Alice series has been announced for early next year) other dolls released as a part of this series include Pullip Alice in Steampunk World, Dal Alice in Steampunk World, Isul White Rabbit in Steampunk World, Taeyang Dodo in Steampunk World and Pullip Mad Hatter in Steampunk World. For as many Pullips have been released based off of Alice up until now there has never before been a full-sized Pullip based off of Cheshire Cat, there has been a Little Pullip + Cheshire Cat as well as a Byul Cheshire Cat that was a part of the Alice du Jardin series of dolls but that has been it which is kind of surprising considering the sheer amount of Alice dolls released over the years (for full list of absolutely all of the Alice dolls see here). As much as I like Byul Cheshire Cat du Jardin somehow she just never quite seemed to fit the character to me, I’ve been hoping and praying for years that Groove would finally release a proper Pullip Cheshire Cat…finally that day has come! 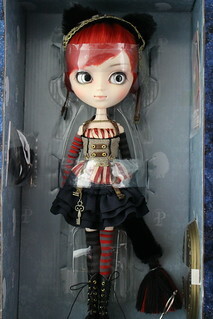 Pullip Cheshire Cat in Steampunk World was released in October in Japan, late November/early December here in the US. 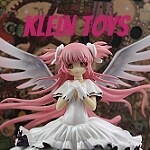 She has a MSRP of 18000 yen. I received my Pullip Cheshire Cat from Pullipstyle a little bit over a week ago and I absolutely could not be happier with her, she was well worth the years of waiting for the perfect Cheshire Cat Pullip. In even more exciting news, Pullip Cheshire Cat was the doll to feature the debut of a new eye mechanism function that allows Pullip to have her eyes partially open instead of just fully open or fully closed which I have already done a little write up of here that you can check out to learn more. 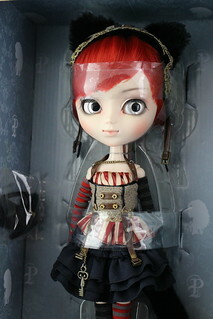 Pullip Cheshire Cat in Steampunk World in the box. I was so excited about Pullip Cheshire Cat that I had a really hard time being patient enough to take box photos before freeing her from imprisonment in her box. First impression looking at her in the box, I’m madly in love and adore all the stripes and contrasting fabrics/patterns. Overall I was very impressed with the quality of Cheshire Cat’s stock, more on that later! In addition to her stock, Pullip Cheshire Cat comes with a collector’s card as well as a gold plastic stand I’m honestly not sure why we seem to be getting so many gold stands lately. How is the quality of the wig? I was pleasantly surprised by how nice her wig is. Not only is her wig incredibly soft and silky but the color is really fantastic too. The red is very bright and vibrant. 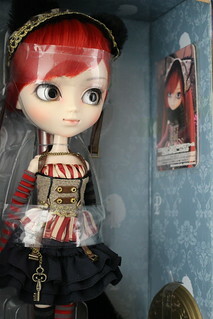 Pullip Cheshire Cat has a great face up. At first glance her face up may seem a bit understated but it is brilliant in it’s subtlety, she has some really nice blushing and shading. It would have been really easy to go crazy over the top dramatic with her which would have been too overwhelming but Groove managed to find a face up that complemented her overall look without going too over the top. I love that her eye makeup includes a slight slight cat eye, her eye makeup is nicely done. Her lips are fantastic, the color in the middle is darker and lightens up towards the outer edges. Her eye chips are reflective silver in color, they almost seem to have a mirror-like quality especially when they catch the light just right they remind me of when I used to have a black cat and all I could see at night was the reflection of the light in his eyes. I love the way her eyebrows are, I don’t know if it’s intentional or not but the way they are painted almost looks like they are fading into existence normally I’m not the biggest fan of this style of eyebrow but it suits her wonderfully. 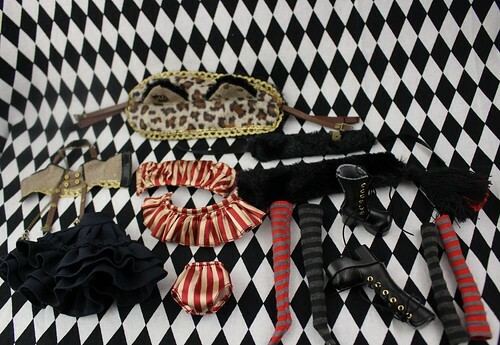 Cheshire Cat’s stock consists of headdress with cat ears, choker, tube top, corset, overskirt with attached cat tail, skirt, skirt, arm covers, underwear, socks and boots. I was honestly kind of surprised by her stock, I didn’t realize that it consisted of so many separate pieces which means that it should be pretty versatile with lots of pieces to mix and match. I also really love the mix of different textiles/materials that makes up her stock. Parts are made of what I believe to be faux fur and leather, while other parts such as the arm covers/socks are made up of cotton then tube skirt, overskirt & underwear are all made up of stiffer material. The colors especially the off-white and red stripes of the tube shirt, overskirt and underwear almost seem to give her stock a circus-y vibe, I absolutely love the bold use of color and the use of the cheetah print on the headdress. Cheshire Cat has a few metal accent pieces including a gear on one of her cat ears, rivets on the other, what appears to be a dice charm on her collar and more rivets on her corset and boots as well as a chain attached to her corset which has a small key charm at the end of it. 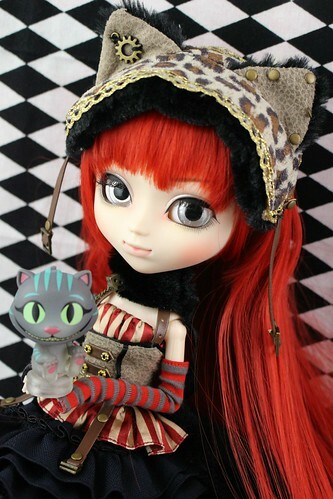 The Cheshire Cat is my favorite character in Alice in Wonderland, so I’ve been waiting a long time for Groove to release the purrfect Cheshire Cat Pullip. Groove not only met but exceeded my expectations with this release, naturally with all this pent up passion and desire for a Pullip Cheshire Cat I could not wait to start photographing her! 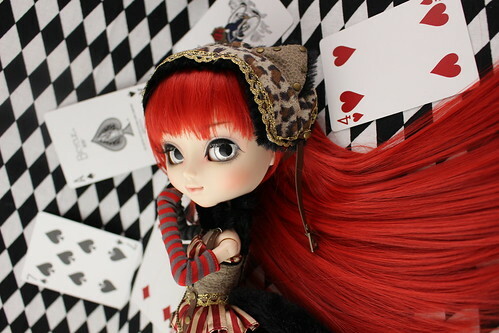 So many of this year’s Pullip releases have had lighter color palettes and natural hair colors (except Amelia with her green and pink streaks) so it is really nice to see a doll in a darker color scheme with bright red hair. 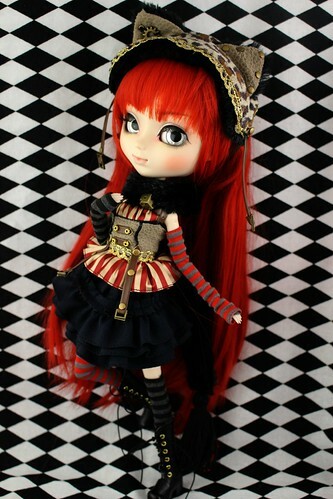 I think Ludmila was the last Pullip to be released with unnaturally bright red hair and she was released way back in 2011. 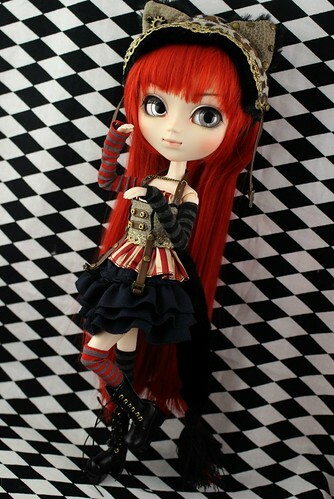 Pullip Cheshire Cat definitely seems to have captured the mischievous nature of the character. I was pleasantly surprised with the matching striped pants that came with Pullip Cheshire Cat so I wanted to include a picture of her wearing them. I think the pants are a nice added touch! Pullip Cheshire Cat with one of my Funko Cheshire Cat figures from the Alice Through the Looking Glass Mystery Minis set (this one is specifically a Hot Topic exclusive). I have various Cheshire Cat toys but somehow I thought the colors on this one in particular really seemed to contrast nicely with Pullip Cheshire Cat’s coloring. 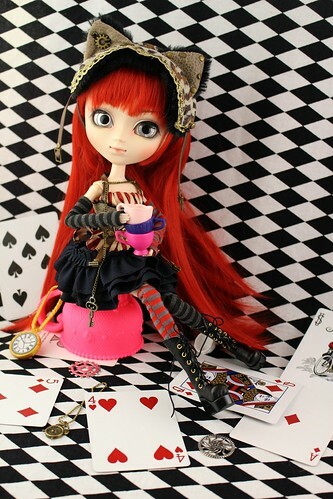 I had a lot of fun photographing Pullip Cheshire Cat, she was just pure joy to play with. I love that the new eye mechanism function debuted on Pullip Cheshire Cat, I don’t think Groove could have chosen a more suitable candidate. The partially closed eyes gives her a bit of a sly expression which suits her both as a character and a doll beautifully! 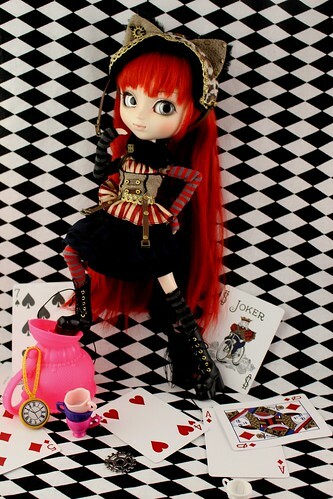 I know a lot of Pullip fans probably question why so many Alice dolls but as long as Groove continues to interpret Alice and related characters in new and interesting ways many people will continue to buy them, I know I will! I really love that Groove included a Cheshire Cat in this series in particular as while the character is incredibly popular I don’t feel like until now it had a proper doll interpretation (I know of Byul Cheshire Cat du Jardin but she looks more like a bear to me than a Cheshire Cat). I also love that they even included the Dodo which they had never made into doll form before, it gives me hope that maybe in the next Alice series I will finally get a Dal Dormouse to go with my Pullip Cheshire Cat! 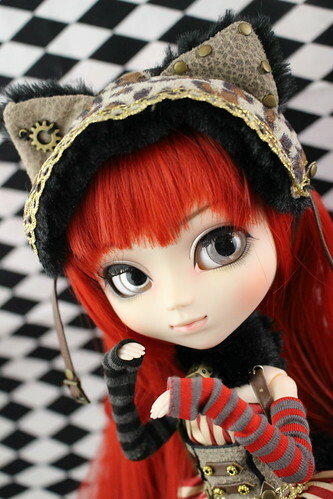 More photos of Pullip Cheshire Cat are available on my flickr. 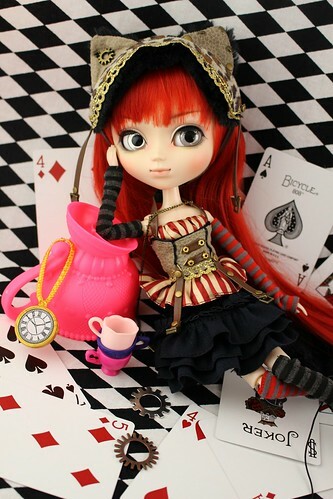 She would make a fine addition to anyone’s Alice in Wonderland or steampunk doll collection. If you find yourself smitten with this kitten, she is available for purchase via Pullipstyle or JPGroove you won’t regret it as she is one cool cat! From what I understand she is already becoming hard to find in Japan so if you want her, I would not delay her purchase for very long as I definitely see her becoming one of this year’s “it girls” alongside Pullip Amelia that everyone wants to have in their collection. 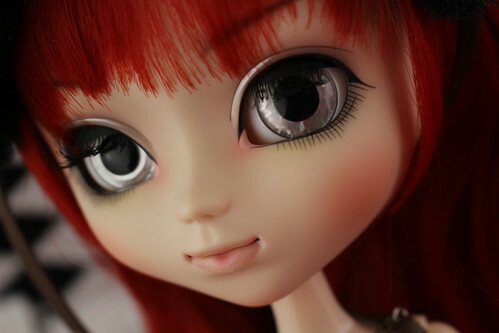 Pullip Lupinus’ review as well as a closer look at the new eye mechanism function will be up next! 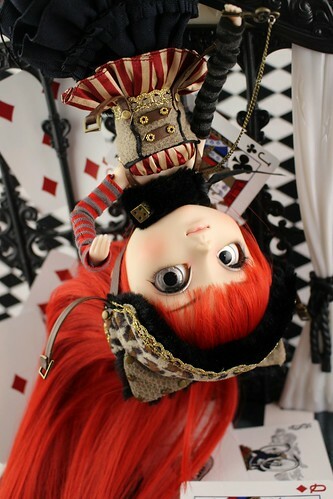 This entry was posted in 2016 Groove, Doll, Pullip and tagged 2016 Groove, 2016 pullip, alice in steampunk world, alice in wonderland, asian fashion doll, cheshire cat, fashion doll, groove, Pullip, Pullip Cheshire Cat in Steampunk World, steampunk. Bookmark the permalink.